This aptly titled sprawling two-plus-hour mystical voyage around the world and into deep space was a full eight years in the making; there are 26 tracks in all, but the music rarely breaks – instead pieces are tied together with interludes that float all the cuts together into one vast epic. There are some periodic reference points that strongly hint of Middle Eastern, African, Asian, Native American and Indian themes, but almost as soon as they solidify they evaporate again as the music evolves off into some deeply introspective, mystical, and dark corner of the universe, or tangents off in some entirely different direction. Sometimes it’s densely layered, ebbing and flowing with intense symphonic (for lack of a better descriptor) waves of melodic grandeur, occasionally approaching chaos, while other times the feel is very sparse and free, as if everything stops while the dreamway looks for a new direction. 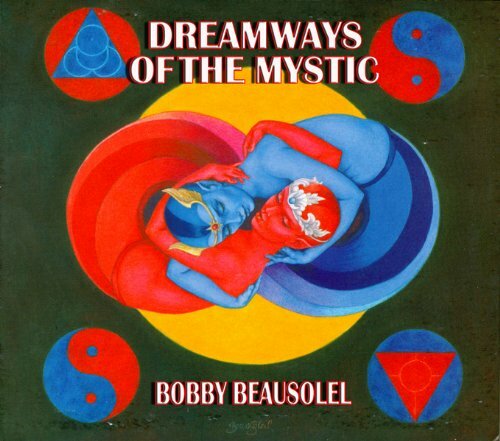 Predominant instrumentation is synths and samples, with electric guitars and percussion playing a primary role in many of the most spirited moments; apparenty all instruments were played by Beausoleil himself. Midway through the second disc, the programme evolves into something very electronic with sparkling sounds overlaying a vast and colorful swirling spectre of sonic imagery. There’s also “Medicine Man,” which features some Native American undercurrents, with guest chanting. Throughout, the overriding themes are explorative and natural, comparable to works of artists like David Parsons or Robert Rich, but with additional darker, menacing moments that offer a slightly different overall trajectory. This one gets my highest recommendation.